SABMiller has announced plans to start construction of its N$360 million brewery and bottling plant in Okahandja, four years after the company was awarded a license by the government. In a statement, the world’s second largest brewer said construction of the planned 260,000 hectolitre brewery will begin April after receiving approval for the re-zoning of 7,2 hectares of land where the brewery will be built. In addition, the company plans to invest in a 750 ml returnable bottle packaging line and warehousing facilities. The brewery is expected to be operational in 18 months. SAB MD Mauricio Leyva said the project has reached an important milestone. “We are most pleased that we are now going to be moving ahead with the construction of the brewery. “The local brewery will not only enable us to make more of our key brands available to consumers in the Namibian market, but it will also make a meaningful contribution to the Namibian economy once it is up and running. In 2010, SABMiller announced the establishment of SABMiller Nambia (Pty) Ltd to house its operations in Namibia. 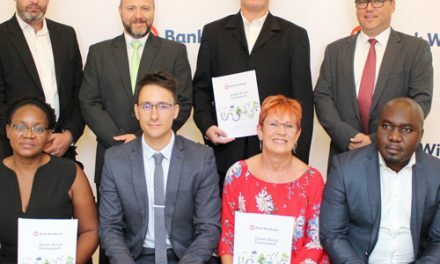 The local unit will be 60% owned by SABSA Holdings (Pty) Ltd, a wholly owned subsidiary of SABMiller, and 40% by local Namibian partners comprising 20% Onyewu Investments (Pty) Ltd and 20% by three charitable trusts for the benefit of local communities. The formation of the new entity allowed for the allocation of a sizeable shareholding to local partners for nominal consideration, which was an important empowerment initiative.